I am now reading in the medical literature about the super-bug Carbapenem Resistant Klebsiella pneumonia (CRKP) Before I retired, I dealt with more than a few cases of MRSA (Methicillin Resistant Staphlococcus aureus) and VRE (Nancomycin Reistant Entercoccus). The overuse and in appropriate consumption of antibiotics in general has lead to these kinds of anitbiotic resistant organisms. In addition, I now hear on the news that radioactivity from the nuclear accident in Japan is spreading across world spread by the wind. We collectively are reassured that the quantitative amount is very small. Now we hear that the water off-shore the defective six pack of reactors is highly contaminated. We are reassured that the ocean will dilute the radioactivity. Japan is still subject to further earthquakes in the future; and I can only conclude that the situation is still very unstable. I am reminded of my medical school days of cultures in Petri dishes, how the organism progressed, and the appearance at the end with overgrowth and death. If we consider the earth one huge Petri dish, will the same process take place on a grand scale? or will Mother Nature bail humans out in the face of an ever increasing population numbers? It seems to me, we are not creating a suitable legacy for our descendents these days. That cupboard at Place of Hawks contained a William Hope Hodgson titled THE VOICE IN THE DAWN which was published in Deep Waters (Arkham House, 1967) as “The Call in the Dawn” I have reproduced the first of 14 pages below, and it has some interesting features. Dereleth had second thoughts on his proposed title “Son of Men” and he annotated it “Deep Waters” at top right beside the punch clip. 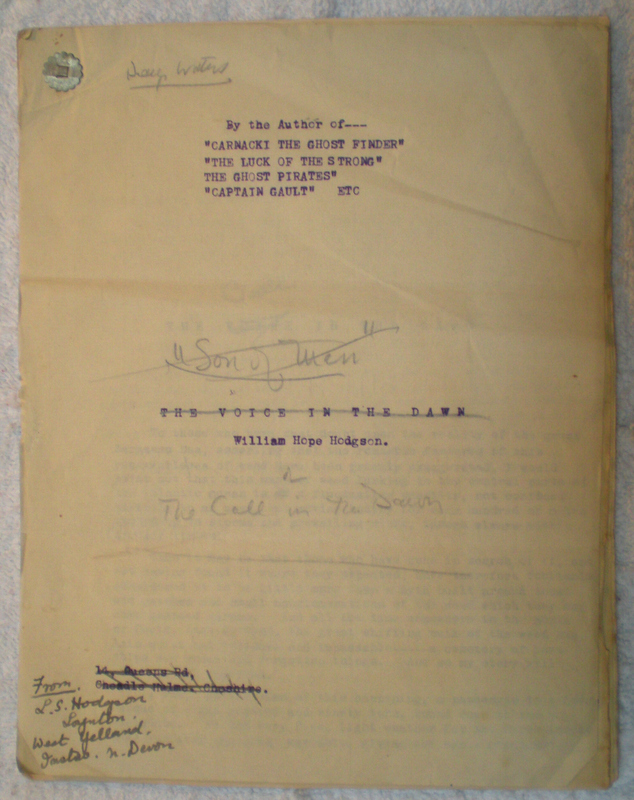 The original author’s address “14, Queens Road, Cheadle Hulmes, Cheshire” has been crossed out with “From L.S. Hodgson, Loynton, West Yelland, Instno, N. Devon.” This was undoubtedly one of several Hodgson manuscripts submitted to Arkham by his estate for publication. “L.S.” was likely the author’s wife or child. Interesting does any read have anything to add? Now that John D. Haefele and Martin Andersson are putting the finishing touches on The Arkham House e-edition of the writing of H.P. Lovecraft in four volumes with many Arkham Cover illustrations, I am starting to compile an e-edition of the writing of another one of Arkham House classics — Clark Ashton Smith. There are some 44 entries for CAS in the index for 60 Years of Arkham House, spanning prose, short stories and verse. In the comic book pile of ephemera I found this photograph. 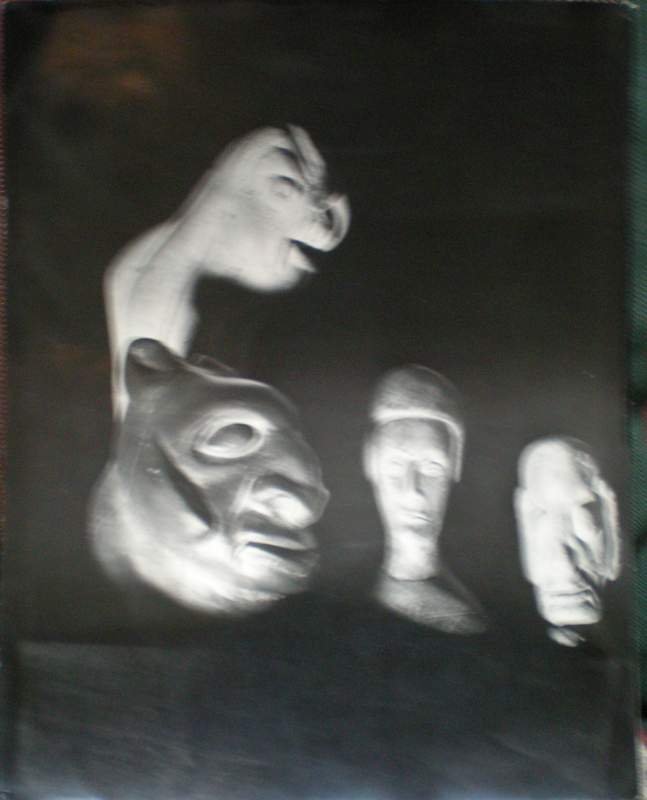 I didn’t know initially exactly what I was looking at, but on the reverse Augie had noted — “Lost Worlds Jacket front.” and so I think this is the inital photo of some of his CAS stone statuary. Seems like this would make a good cover for one of the e-books. Scott Connors and John D. Haefele will be in charge of compiling and ordering the text.